Use AMA Style (American Medical Association Style) to format papers. 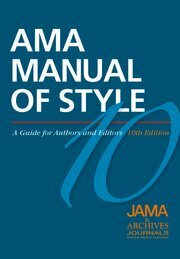 The 10th edition of the American Medical Association Manual of Style online contains everything medical and scientific researchers, writers, and editors need to produce well-organized, clear, readable, and authoritative manuscripts. The Library has access to the full online manual. With this interactive edition, users can annotate their online manuals, bookmark, prepare style sheets, and save searches. The next edition is planned for 2017. When in doubt, err on the side of caution, and cite. Please note: Some browsers may show italicized text as underlined. When preparing bibliographies based on any of the formats addressed by this series, italics are specified, and should be used.